In the latter part of 2015, November 16th to be exact, there was a Beyond The Headlines television programme on GBN which dealt with the public safety of derelict buildings in our Capital City, and previous to that (programme) the New Today gave extensive coverage to this emerging scourge in our urban environment, together with the CaribUpdate Weekly admonition (editorial) of Dec. 9, 2015, for an “Eminent Domain law needed for revitalization” of our urban centres, with special reference to St. George’s as our Capital City and premier tourism and heritage site. This challenge would have fallen squarly on the shoulders of LOCAL GOVERNMENT had Grenada the wisdom to retain it, as is the norm in other CARICOM jurisdictions. The safety and wellbeing of the public can be described as dangerous, when the physical (natural) and man-made environment have deteriorated to such an extent, that they negatively impact the human person(s) who live or perform their daily occupation within the affected area(s), resulting in serious accidents, health related issues or even loss of lives, not to mention the parlous existential condition of survival and being, or should we say well-being. For the benefit of the Parliamentary Representative for the Town of St George, the Ministry of Works, the Physical Planning Unit (PPU) and the Ministry for the environment, the Sentinel is providing hereunder a partial list of such buildings, with the hope that the necessary remedial works will be initiated, and where necessary undertaken in 2016 by the relevant authorities, in keeping with the United Nations Habitat III symposium later this year, which would analyse cities in the 21st century and the growing expansion (urban migration), with the required upgrading this century of Human Settlements globally. PURE GRENADA hopefully, would avail itself the opportunity to benefit from this enlightened conversation. York House, the former Parliament building on Church Street. 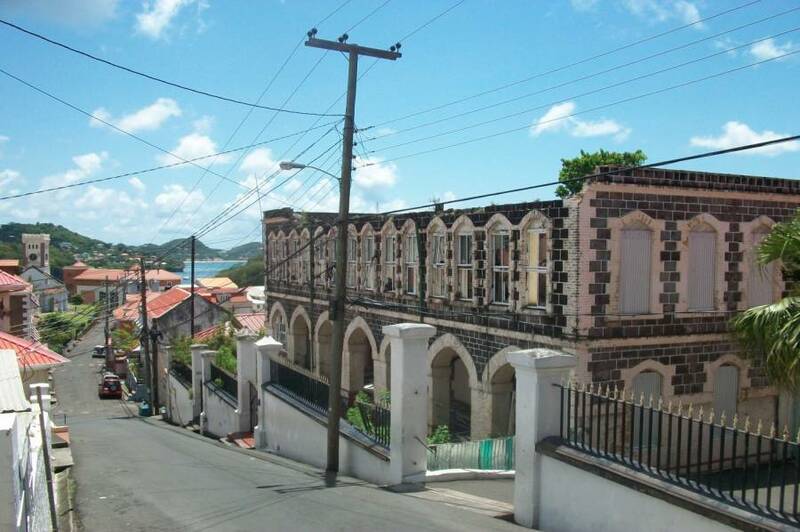 Abandoned since Hurricane Ivan in 2004 – A major heritage building which must be restored. 3 storey derelict concrete building adjoining the Police barracks on Melville Street. (without a roof) – should be restored. Single storey brick building at the junction of St John’s and Halifax Streets, in which a tree is growing through the collapsed roof. Unfinished clay block building on Scott Street, without roof and appears to be structurally unstable. Board building at the junction of St John’s and Grenville Streets – nearing collapse. A public health and safety hazard. A portion of the historic first floor cast iron balcony along Granby and Halifax Streets where Huggins Farm and Garden Store is located. Two storey brick building on Halifax Street, previously occupied by L.A. Purcell. The burnt out 2nd floor was demolished a few years ago for Public Safety and health reasons. The stone buildings around the Drill Yard on Young Street which were occupied by vagrants and resulted in a fire about 2 to 3 years ago. The derelict and abandoned building on the Carenage at the corner of Hughes Street, nearing collapse. Derelict house on St John’s Street opposite to the Day Care Centre. Collapse house on Deponthieu Street next to the Day Care Centre. A partly completed block wall aberration on Church Street without a roof, was/is the office of a lawyer – next to the Gore Street steps opposite the Anglican Church. Authentic Sedan Chair Porch brick house, also on Church Street next to GTM Insurance Co. A tree is growing through the roof which has mostly collapsed and is the home of rats and rodents. (A Safety and Health hazard) – An important heritage building. The abandoned old Abattoir building on Melville Street (A historic structure which should be restored). The rock face behind the building could pose a public safety hazard. An abandoned former lawyer’s office at the junction of St. John’s and Upper Church Street opposite the R.C. Cathedral (could be the home of vagrants and a fire hazard). Recent collapse of a concrete retaining wall along a public highway in St. Andrews killing one and injuring three. Closure of the Public Library since 2011 due to unsafe working conditions and falling roof tiles onto the street posing a public safety hazard. These are just a few buildings and structures in St. George’s and elsewhere that can adversely affect PUBLIC SAFETY, health and the economic viability of our premier urban centre at present, in the foreseeable future and beyond.